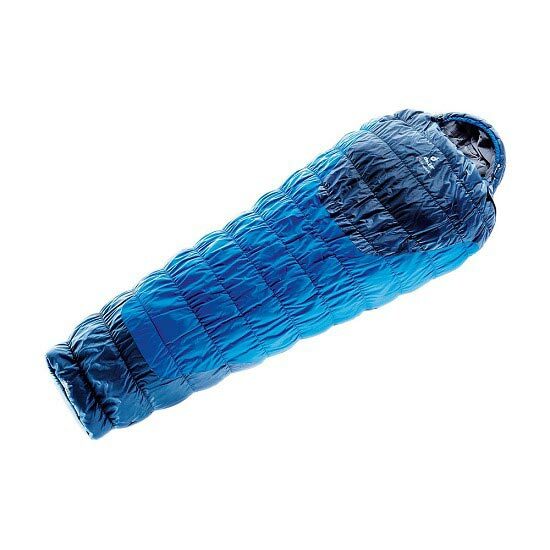 Women&apos;s mummy sleeping bag by Deuter, designed for camping, trekking and use in mountain huts. Highly compressible, it takes up little room in your pack. Made with Thermo Stretch Comfort stretch seams which provide up to 25 % expansion in width. This brings the insulation close to the body, eliminating cold spots, yet guaranteeing comfortable freedom of movement. Filled with Deuter Thermo ProLoft®. A special thermal process turns polyester fibres into top quality technical Thermo ProLoft® insulating fleece. Easy care and durable yet compact with excellent insulation at minimal weight. The synthetic fibres also absorb very little moisture. Short drying times, excellent loft and thus insulation properties even when damp, are all advantageous characteristics. Deuter Dura Lite RS outer nylon ripstop fabric is supersoft & lightweight. This ripstop−nylon weave features a water repellant finish. Polyester 50% & nylon 50%. Packed dimensions: 16 x 39 cm. Outer fabric: Deuter Dura Lite RS. Inner pocket for small items. Customer Opinions "Exosphere +2° W"